“I love the juxtaposition here…” What do you think how Steve in AoU seemed to say that Steve Rogers died in 1945 and there is only Captain America now. That he doesn’t deserve home and family (with Natasha!) and there is only war for him. I was sadden by it for Cap has always been my favorite (especially with Evens Portrayal) I believe he deserves some peace (with Natasha!). (x). Oh man, Anon. I feel like Steve’s PTSD was one of the few things Age of Ultron did right. (Although before I start, I should mention I don’t ship Natasha and Steve as anything but friends). There were so many lines in AOU that gave insight into Steve’s depression, listlessness, and feelings of disconnect. It’s woven into every Steve scene, and it’s amazing. Right at the start of the movie, Sam encourages Steve to look for a place in Brooklyn, but Steve keeps resisting. He jokes that it’s too expensive, but he doesn’t reply when Sam says “But home is home, y’know?”. In fact, he looks forlorn, staring out at the party below – not joining in, separated from it all. It’s a thousand yard stare, typical of PTSD and the battle-worn soldier. It’s questionable whether Brooklyn is Steve’s home anymore. Can Brooklyn still be home, if all the buildings are gone, the old neighbourhoods have vanished, friends and family are dead? What is home to Steve? 1945? Because if that’s true… he can never go home. 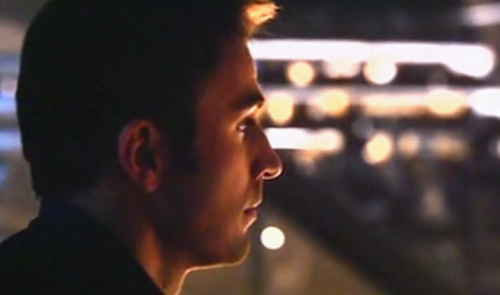 The concept of ‘home’ definitely plagues Steve throughout the film. In the same scene, he tells Bruce in a self-deprecating tone that he’s the “world’s leading authority on waiting too long”. It implies that he hasn’t moved on from Peggy and still feels regret. It’s important to note that this is all said and done at a party that’s happening because the Avengers have ‘put an end’ to HYDRA and the Chitauri. Steve should be thrilled, but instead you see how lonely and out of place he feels. He spends more time wandering than interacting with the other Avengers – with one exception. He spends significant time with Thor, who really IS the Outsider. It says a lot. 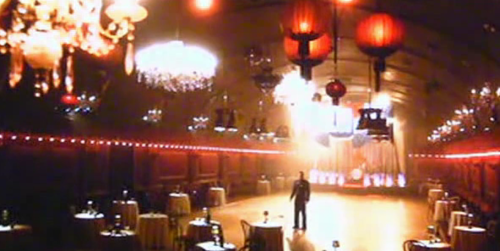 …And then Wanda’s vision scene. Where the dancing turns to brawling and the wine stains become blood. That moment gave the best insight into Steve’s PTSD. His perception is forever tainted: war is all he sees, and he can’t escape its horrible aftermath. Worse, when Peggy asks him to imagine going home, the dance hall empties. Steve literally can’t imagine it. He’s always on the outside, looking in: people celebrate the war being over as he walks through their scene, but his own dance hall is empty. There’s this horrible melancholia to the entire scene. Then the farm. Again, it’s Thor and Steve – the outsiders – who are most uncomfortable with Clint’s family. Steve basically clings to Thor until Thor leaves, and then Steve can’t cross the threshold to go back inside the house. It’s a home he’ll never have, that slipped from his grasp when he crashed the plane. I think it hurts Steve to see the farm – it’s the American Dream he builds for others, but can’t have for himself. The American flag in contrast to Steve’s uniform is a nice touch. When Tony mentions that Steve walked away from Wanda’s vision seemingly undisturbed, it’s just another tell. The vision didn’t shake Steve because it was nothing new, the same PTSD he lives with daily. And when Tony remarks “Isn’t why we fight so we can end the fight? So we can go home?”, Steve rips a log in half. Because again, what is home to Steve? He has no home. His fight doesn’t end, as his vision showed him. Steve’s lost sight – he doesn’t even know why he fights, anymore. There’s a line later on where he mentions they may be monsters, which is such an unusual line for Steve. The only thing Steve feels like he has anymore is Captain America: it’s his only place, purpose, and sense of belonging. It sounds like it’s the only reason he leaves the house (”I have no plans tomorrow night”). In fact, the only time Steve has friends is when he’s Cap, when he’s fighting some battle. As he says, Steve Rogers was buried 75 years ago, and someone else came out of the ice – a different Captain America than the one he built. And Steve has no control over this Captain America. The idea became something beyond Steve while he was on ice, so even his superhero persona isn’t his own. Steve Rogers is fading fast, and this idealized Cap is taking over (”Language!”). There’s practically NOTHING that Steve can say is his: no home, no personality, and no persona. That’s jarring, and scary as hell. Because then you have to ask… who is Steve? Of course, there’s hope. In CATWS, Natasha gets a glimpse of Steve Rogers, and she sees him as something more than Captain America – not the other way around. His friendship with Sam is a good way to bring stability to Steve’s life, although now Sam is an Avenger, so maybe not. But I think Bucky’s presence will help Steve most of all.Whether you ship them or not, you can’t deny that Bucky is Steve’s connection to who he once was. Steve’s friendship with Bucky was huge part of his personality, back when he was skinny Steve Rogers. Bucky was with him through everything (”best friends since childhood…”) and helped shape who Steve became. They practically defined themselves through each other. What happened to Bucky is a reason for Steve to keep fighting, and watching Bucky find himself again may be the push Steve needs to find himself, too. I don’t think Steve Rogers is dead and gone – I think Steve’s completely lost himself. And I’m hoping in Civil War, his reunion with Bucky will bring him back to who he once was. Just like Steve carried with him who Bucky was, and helped Bucky remember – Bucky will help Steve remember himself, too. Because Bucky is home. This entry was posted on August 24, 2015 by lorimori and tagged bucky barnes, captain america, marvel cinematic universe, ptsd, steve rogers.